OK - so now you know who I am and why I do what I do. But what am I doing here? In the blogosphere? Well - I love what I do! I cannot imagine doing anything else, I adore going to work every day (well - most days) and I think I am good at what I do. Don't get me wrong, I don't think I'm all that, I don't want to come off as cocky, but I've worked very hard to learn how to teach kids with autism and I feel like I am beginning to apply what I've learned in my classroom. Some of my coworkers (and my husband, but he's biased) have encouraged me to share with others. As sort of a test drive, I posted about task boxes on my personal blog (http://nicolemays.blogspot.com/2009/03/task-boxes.html) - and got a pretty good response (it's the only post that ever gets read LOL), so I figured I would try it. My plans for this blog are to have more posts like the following - basically just a description of something I do in my room, why I do it, how to do it, etc. I hope to intersperse some product reviews/recommendations as well. match identical objects, originally uploaded by MNicoleM. So anyway, task boxes. People with autism tend to be very visual thinkers. There's a program called TEACCH (www.teacch.com) and one of the basic principals is visual structure. 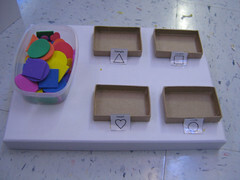 Applying visual structure to learning activities leads to task boxes. 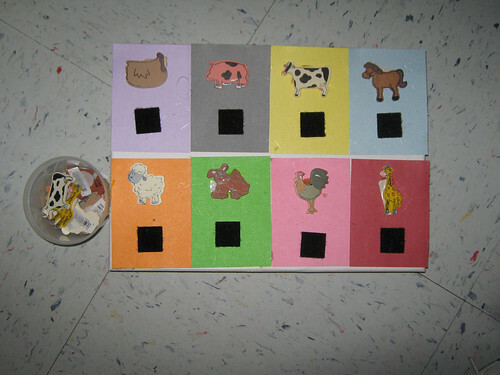 They are self-contained activities (in this first instance, the activity is matching animals). The student can see how much work there is to do and can tell what to do by looking at the materials. The teacher can work one on one with the student on a new activity or skill and when the student starts to become comfortable with the activity, they can work independently to practice the skill. This is more meaningful for the student than completing worksheets because the materials are manipulative and it is also more practical, especially if the student isn't able to read and write (which would make completing a worksheet independently pretty difficult). Additionally, because students with autism often need lots of repetition and practice on a particular skill, you would have to make several copies of the same worksheet and waste a lot of paper - this way you just pull the pieces off and the task is ready to be used again for continued practice. As for making them - you can find lots of "file folder game" activities for regular ed students online and in teacher stores, many of those same activities work well with students as "task folder" activities. Also some commercially produced materials lend themselves very well to task boxes. 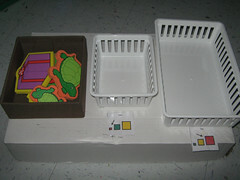 Below is a size sorting task I made with a size sorting kit from Lakeshore (www.lakeshorelearning.com) as well as a patterning activity and another size sorting activity I made out of materials from a commercially produced kit I bought from a teacher store or catalog (don't remember which one ...). 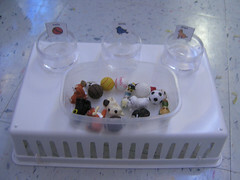 Pretty much any teaching materials can be glued and velcroed to create a task box. I have also used erasers - they make erasers in all kinds of shapes and you can do lots of matching/sorting/counting activities with those, counters, those foam shapes, buttons, beads, dollhouse furniture and accessories, etc. I went to Hobby Lobby and Michaels, bought lots of these things and made tons of task boxes in the past few weeks (I have a student teacher and have time to do things like this now lol). Here are some more examples of the ones I made. For the "box" part of it (the base), I used little plastic baskets, lids to paper boxes that copy paper comes in, plastic trays, boxes meant to store and file photos in, and sometimes just a piece of cardboard or posterboard. Anything sturdy enough to attach the base pieces to! 6 Responses to "Task Boxes"
I'm going to throw a wrench into the works. What about the student with autism who is also visually impaired? Some blindnesses (Leber's congenital amaurosis, for example) are genetically linked to autism. I'd use tactile task boxes in that case - shapes would still be OK, some items could have tactile cues added... for some other things task boxes wouldn't be appropriate with visual impairments. I'll have to look into that farther - I had never heard of Leber's congenital amaurosis before - yet another example of "the more I learn, the more I realize that I don't know!" Leber's is a congenital blindness that is fairly rare: 1 in 33,000 births. Compare that to Down Syndrome, which occurs 1 inevery 700-800, and you get the idea. However, Leber's has gotten a little more press since Derek Lee (Chicago Cubs) made it public that his daughter has Leber's and established a research foundation for the disease. Thanks! I read a little about it last night online after your comment :-) I have had two students with autism and mild visual impairments, but they only needed high contrast, larger print, etc. - not sure how I would adapt materials for someone with a more severe impairment beyond using objects instead of pictures and adding tactile cues. But it's a great thing for me to start thinking about it! Thanks!! Hi, I am a teacher for the blind and visually impaired. 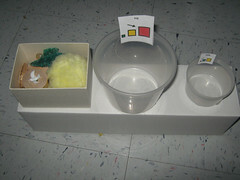 I have been using the box tasks for a child who is has a vision impairment and who has autism. 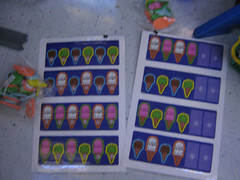 I have found that almost every task can be adapted for a blind or visually impaired student. Puff paint, textured paper or cloth, button, bells, anything with sound or texture or real object can be used to adapt! Play around with your materials and see what you can come up with. 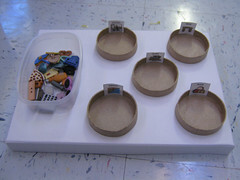 I have made some very neat boxes and my student loves to work with them. I stumbled across your blog in a research frenzy and I am so happy I did! I am teaching a 6:1:3 elementary autism classroom in the fall on a provisional certificate, as a nyc teaching fellow. I feel a little clueless and a lot overwhelmed, but your site has had the most practical information I've been able to find anywhere! So thank you for that! I have so many questions! How do task boxes/file folders fit into instruction? Do you use them mainly for independent practice? I am feeling a little lost with regards to how I will structure my lessons. Most of my students have severe autism and cognitive delays. How do you go about introducing activities like these? Where do they fit into the curriculum (English/Math, etc)? I know this is an old post and the chances of you seeing and responding are slim but I thought I'd give it a shot anyway. Thank you for writing this blog!